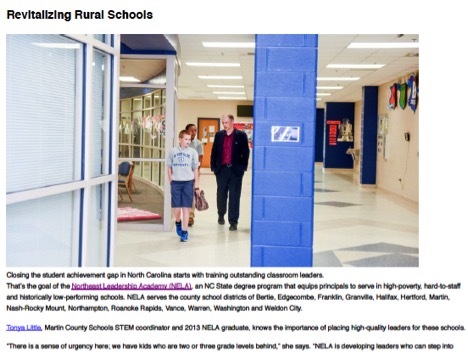 NELA, was envisioned as a solution to the stubborn problem of recruiting and retaining strong leaders for historically low performing rural schools. Since the first NELA cohort graduated in 2012, we have produced 31 Principals, 52 Assistant Principals and have an additional 8 graduates in other leadership roles. Our graduates go right to work making rapid school improvements. Manna, P. (2015). 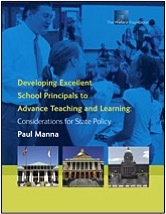 Developing excellent school principals to advance teaching and learning: Considerations for state policy. Alvoid, L. & Black, W.L. (2014). 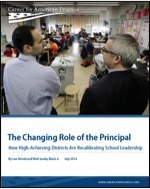 The changing role of the principal: How high-achieving districts are recalibrating school leadership. Lerum, E. (2016). 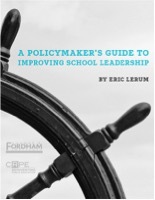 A policymaker’s guide to improving school leadership. successful schools: Building and maintaining a quality workforce. 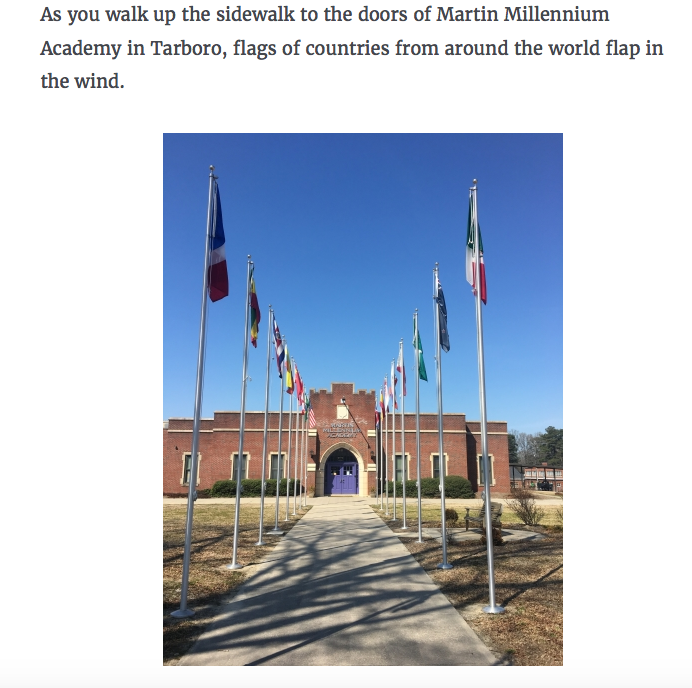 Martin Millennium Academy was highlighted in the EdNC article titled “Restoring Pride in Tarboro” by Nation Hahn on March 23rd, 2016. Erin Swanson was the principal at Martin Millennium at the time of the article with Keith Parker serving as Principal Resident. 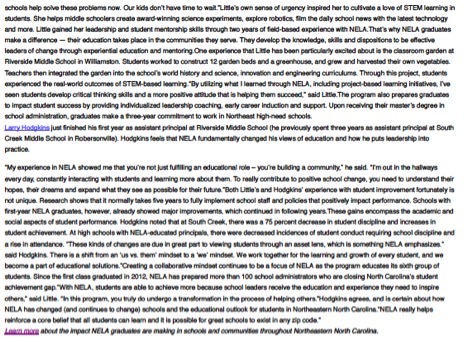 NELA Cohort IV’s Keith is the current Principal at the school. The article highlights the demographics of Edgecombe County where “the median income is $31,615 and 38.1 percent of children live below the poverty line” (Hahn, 2016). Ms. Swanson was the founding principal at the school. The school enlisted a “Global Schools Model” which involves Visiting International Faculty and Immersion Courses. View a PDF version of the article or read it on EdNC’s website. In February, 2016, Cohort IV Fellow, Cliff Hudson, received the Burroughs Wellcome Fund Promoting Innovation in Science and Mathematics grant. The grant awarded $4,000 to South Creek Middle School for Cliff’s project “No Child Left UnSTEMulated”. For more information abut the Burroughs Wellcome Fund, visit their website. May 2015 – NELA Fellow, Kendrick Alston received the Elementary Assistant Principal of the Year Award. 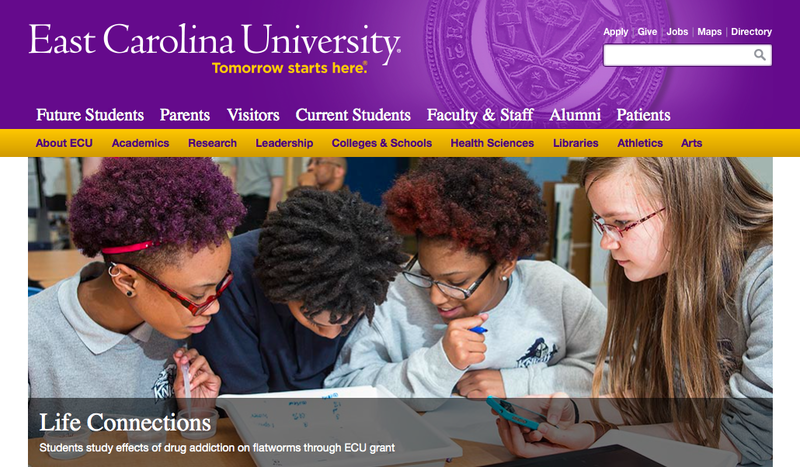 Riverside Middle School, where Tonya Little is assistant principal, had the opportunity to learn about addiction through a hands-on experiment with flatworms. The students also used sugar and caffeine as addictive substances. They were able to participate in the learning opportunity through a grant from East Carolina University. To read more about this project, click here. 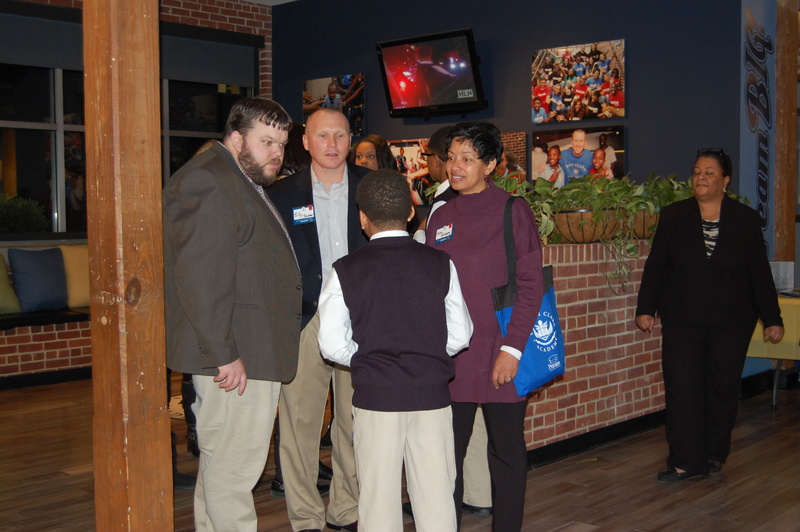 Cohort IV and some fellows from previous cohorts were accompanied by Dr. Wirt, Dr. Riddick, Jennifer LaGarde, and Leelynn on the trip to Atlanta, GA. Friday evening, busloads of educators were greeted by Ron Clark and his enthusiastic students and teachers. Friday night events included a school tour of RCA and its new facility and a surprise party! 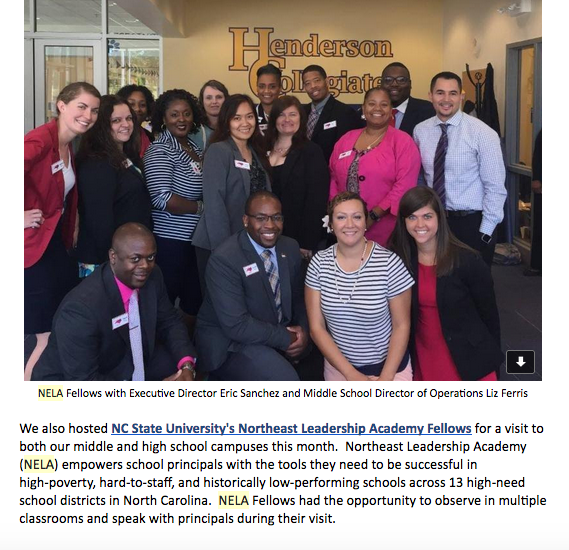 NELA fellows and staff were impressed by the student tour-guides. Saturday consisted of valuable workshops, including a lesson by Ron. NELA fellows put on their best tacky outfits for the Prom on Saturday Night! On Sunday, we said goodbye to RCA, heard a special message from Kim Bearden and other instructors, and had the opportunity to ask questions. It was an awesome and inspiring trip! Students ranging in age from 9 to 14 competed in a regional tournament focused on STEM concepts on November 22nd, 2014. It was a FIRST (For Inspiration and Recognition of Science and Technology in students) Lego League qualifier tournament. The teams participating created and programmed autonomous robots. They also did a research project to develop innovative ways to incorporate technology in the classroom. 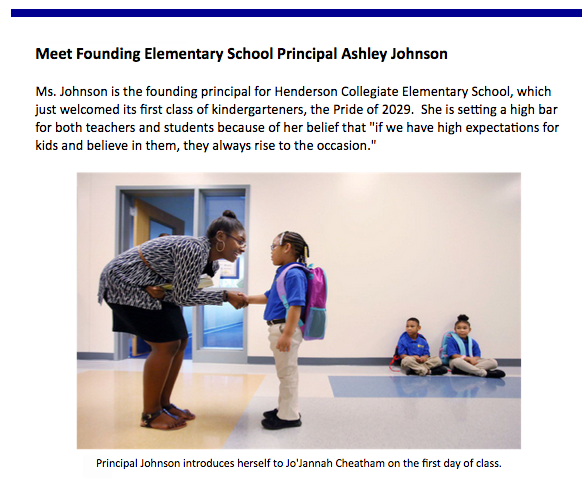 Tonya Little, a NELA Cohort II fellow, serves as assistant principal at both Riverside Middle School and South Creek Middle School, in Martin County. She also severs as the STEM Coordinator for Martin County Middle Schools. Both Riverside and South Creek Middle Schools were recognized in the FIRST Lego League qualifier tournament. Riverside Middle School received “First Place for Innovative Solutions”. The team created a way to use the Mindcraft video game to teach mathematics skills. South Creek Middle school received the award for “Best Presentation”. Their project focused on showcasing the path nutrients take in the body. South Creek Middle School will advance to the Statewide Tournament on January 17th at North Carolina A&T. This story was featured in The Enterprise and Weekly Herald of Martin County. To access the full article, visit the link below.